Garbine Muguruza arrived at Roland Garros carrying the weight of expectation, with the defending champion hoping to capitalise on a WTA field without the shadow of Serena Williams looming heavily from the top of the draw. However, the Spaniard was unable to repeat her heroics from the year before. Muguruza will head to the grass-court swing hoping that a lack of expectation can work in her favour. Muguruza has endured a difficult year thus far. She made semi-final appearances in Brisbane and Rome, which have the dubious honour of being both her best performances in a tournament in 2017 but two matches that ended in retirement. Muguruza's Australian Open ended in an emphatic quarter-final defeat to Coco Vandeweghe, and the clay-court tournament in Madrid saw a home crowd witness a first-round exit. However, Muguruza looked like she was finding her feet at Roland Garros. Francesca Schiavone and Yulia Putintseva were dismissed in straight sets, whilst the demons from a defeat in Stuttgart were exorcised when Muguruza overcame Anett Kontaveit in a gritty three-setter. The round of sixteen would prove to be Muguruza's undoing, with an unfavourable tie against Kristina Mladenovic providing an opponent who conflated vigorous home crowd support with in-form tennis. The Frenchwoman willed her way to a 6-1 3-6 6-3 victory, and Muguruza later spoke of her displeasure with what she perceived to be an inappropriately behaved home crowd. The Spaniard was moved to tears in her press conference, a result of the tiring loss against Mladenovic and a culmination of pressure at the place where she won her first Grand Slam. 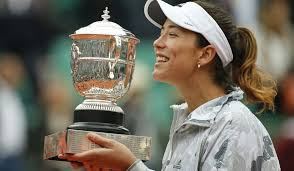 Having been tipped to dominate the game after that famous victory, Muguruza has struggled to make a massive impression on the WTA tour and at the close of the French Open she will find herself at 14 in the world rankings. However, Wimbledon could provide some unlikely solace. Muguruza can be backed at odds of 8/1 in the tennis betting to triumph on the grass of Wimbledon. She sits alongside Maria Sharapova, Jo Konta and Petra Kvitova among the favourites to take the tournament with newfound levels of openness in the absence of Serena Williams. Yet the most compelling case can be made for the Spaniard. Muguruza has a history of success at Wimbeldon, having made the final in 2015. A swashbuckling run saw illustrious opponents Agnieszka Radwanska and Angelique Kerber defeated. The latter has since gone on to become the world number 1 but arrives at Wimbledon in torrid form. Muguruza can take advantage of the lack of strong contenders. Sharapova and Kvitova are previous winners of Wimbledon but have played little competitive tennis of late for very different reasons, whilst home favourite Konta has only made it past the first round of Wimbledon on one occasion. The spotlight is away from Muguruza, with her title at the French Open ensuring that the clay court will be where expectations are highest of her. Having endured a troubling year since her Slam success, she can thrive at a place where only Serena Williams could stop her in 2015. It will be worth paying attention to Muguruza's fortunes in the grass-court tournaments preceding Wimbledon but a semi-final appearance somewhere will stand her in good stead to challenge for the championship in London.